The Best Big Finish Doctor Who Stories For Newbies, Part 2 | Warped Factor - Words in the Key of Geek. Tony exceeds the limit. Again. There’s a general rule here at WarpedFactor: we try not to go beyond 1500 words per article, because, y’know, people have lives, and big as our egos are, we don’t want to take up too much of them at a time. Nevertheless, trying to prescribe a quick buyers guide to the best of the best on a by-Doctor basis is a tough one to do within the word-count, simply because there are so many red-hot must-buys to choose from, and so much to say about them. Bear with us on this one, and while everyone has their own ideas of what the best stories are, hopefully if you’re a newbie to Big Finish, this list won’t steer you actively wrong at any point. Part one of this article, featuring Doctor's One to Four, can be found here. Genesis of the Cybermen. Spare Parts has been regarded as a classic since it was released, and it stands up fourteen years on as an utterly hypnotic listen. The Fifth Doctor and Nyssa are there are the birth of the Cybermen as an independent life-form, dealing with the people from the generation before – the people of Mondas who have yet to surrender their emotions to the necessity of survival. Marc Platt excels himself in creating a mythos that’s as big and emotionally hard-hitting as anything that was ever seen on-screen. Two stories that mark the return of Adric to the Tardis, telling early Fifth Doctor stories of Mathematical evil, locked room mysteries, and the subconscious, Psychodrome by Jonathan Morris helps build the connections between the new ‘young’ Doctor and his companions, while Iterations Of I by John Dorney simply scares the living daylights out of you. Paul Magrs nearly made it into the list twice (check out The Lady of Mercia), but The Peterloo Massacre is a pure historical, with history itself as the Big Bad, and the mean spirits of human beings as the drivers of tragedy. It’s Doctor Who meets An Inspector Calls, matching a sharp social conscience with rollercoaster storytelling that won’t let you go till the very end. Joseph Lidster, charged with doing something unusual with a companion and the Cybermen, brought Janet Fielding’s Tegan back for what was envisioned at the time as being her only Big Finish story. It’s an older Tegan we meet here, one for whom life didn’t go the Sarah-Jane route after leaving the Doctor, one who did what she needed to do to get by. Now, since Fielding joined the Big Finish fold for more and more adventures, The Gathering is something of an anomaly, but as a story in itself, it’s an object lesson in the fact that not everybody’s life is improved by having spent time with the Doctor. Don’t listen to this one if you don’t like the trend in New Who towards comedy Sontarans. If that doesn’t bother you at all, go for Heroes of Sontar with all your heart – it’s comedy Sontarans with a purpose, meaning writer Alan Barnes both has his cake and eats it, treating them comically, then revealing why this assortment of useless Sontarans has been gathered together on a single mission. If comedy Sontarans really bug you, go for Circular Time, a series of four short stories which give different perspectives from crucial moments in Nyssa’s life. 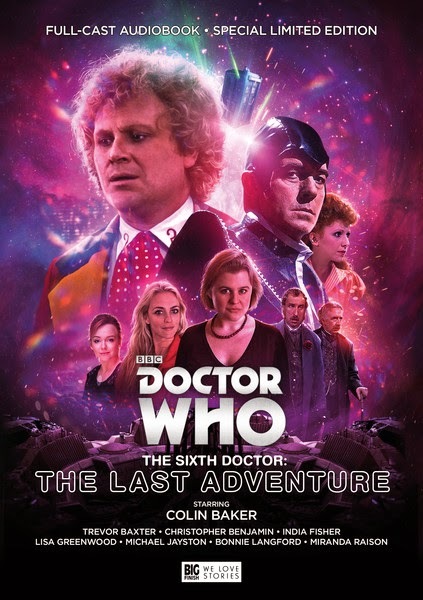 It might seem antithetical to start with something called The Last Adventure, but this is a set of four stories that’s been thirty years in the making – the run-up to the Sixth Doctor’s regeneration. Taking four incidents from – ahem – different epistopic interfaces of the spectrum as far as the Sixth Doctor is concerned, and viewed chronologically from the point of view of the Valeyard, it’s something of a love story to Old Sixie, leading to the final battle he deserved, rather than simply being hit by meteorites, falling over and turning into Sylvester McCoy in a wig. If you get nothing else from the Sixth Doctor, get this one. A standalone, continuity-light story that explores Davros’ history, motives and capacity to change, this Lance Parkin story sees Davros and the Doctor working and talking together. If you enjoyed The Magician’s Apprentice/The Witch’s Familiar, this one’s for you. Also, it has fewer sewers. A blistering Dalek story, set just a little before the events of The Dalek Invasion Of Earth, but in the same country under occupation. The Sixth Doctor has to tiptoe around history and fundamentally quell his instinct to get involved and help overthrow the tin-pot dictators from Skaro, so as not to upset the web of time. A cracking thriller with an extra dimension from Mark Wright and Cavan Scott. Another in the loose trilogy of stories where authors did something with companions and Cybermen, The Reaping sees the Doctor take Peri home to face her family and friends, after skipping out on them in Lanzarote to go zipping through time and space. A story dealing with grief, friendship, families – and a creepy Cyber-cull by Cybermen from the future, Joseph Lidster’s The Reaping builds the character of Peri up while tingling with Cyber-potential. Not one to listen to alone at night in the dark. Technically a Companion Chronicle, this still stars two Doctors, and for the most part is structured like an engaging satirical farce on the notion of Doctor Who itself. But there are great things here – both a sense of how Peri can exist and not-exist, how she could be dead and married to Yrcanos and a whole lot of other things besides. And there, towards the end, there’s a sequence which will punch you right in the stomach and steal the breath from your lungs. Do not miss the Piscon Paradox. Nev Fountain delivers something truly special. Like Davros, there’s no chronology to this story – it’s a world in and of itself, designed to stretch our understanding of a familiar character. What would happen if the Master turned good? The premise is so strong it was later re-used in the TV version of Who, but Master is much, much better than Utopia. 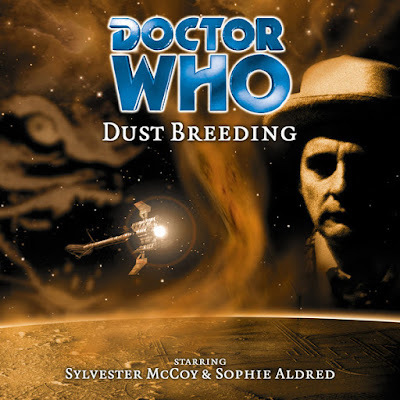 Geoffrey Beevers gives us a lesson in the conflicted self, while Sylvester McCoy has never been better as the Master’s childhood friend. Philip Madoc turns up here too, in a surprising but enormous effective role. A must-listen story by Joseph Lidster. A dusty planet and Edvard Munch’s painting, The Scream are the unlikely catalysts for some seriously creepy action in this story from Mike Tucker. Along the way there’s a dissection of art, beauty and trendiness, but really, that’s window dressing for the central evil, which steals the show, the furniture and pretty much the whole recording studio. LIVE 34 is a weird one, taking liberties with presentation style – everything for the most part here is presented as a radio interview, and we follow the events of a dictatorship and uprising through reports and interviews, breaking the usual narrative flow of Doctor Who stories. Innovative and gripping all the way through, this story by James Parsons and Andrew Stirling-Brown will give you a fresh take on the activities of the Doctor and Ace from the ground up. Dan Abnett’s story of companions and a new take on the Cybermen is perhaps the most surprising of the three we’ve highlighted – in a hospital in the near-future, advanced medical science is answering the call of some Cybermen, turning them back into flesh and blood human beings. Could this be a new dawn for the Cybermen? Quite as much as this, The Harvest is a good jumping-on point because it introduces us to a significant audio companion of the Seventh Doctor, Hex, played by Philip Olivier. There are plenty of other contenders for the fifth place – UNIT: Dominion is the start of a new arc for fans. All-Consuming Fire is actually a better novel adaptation. 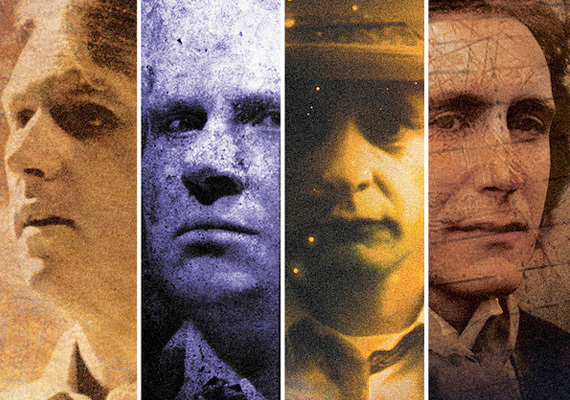 Mask of Tragedy is just glorious fun, away from all the sturm und drang of the Seventh Doctor’s brooding personality, but as beginnings go, it has to be Love And War – the Virgin New Adventure novel that wrote out Ace and wrote in Professor Bernice Summerfield, brilliant archaeologist with a life of her own. The story, originally written by Paul Cornell and adapted by Jacqueline Rayner, is as odd as only the Virgin New Adventures (and maybe the Eighth Doctor Divergent Universe) could be, but in putting an end to Ace’s story of development before she spends much longer than the TV run in the Doctor’s company, and in introducing Bennie, it’s a must-listen audio story. The first Eighth Doctor story’s a great jumping-on point – he’s still got his Tiggerish quality from the TV movie and he meets his first audio companion, self-styled ‘Edwardian Adventuress’ Charlotte ‘Charlie’ Pollard (India Fisher). Fisher and McGann stake out a great bouncy partnership, and there’s also an invigorating performance from Gareth ‘Blake’ Thomas to kick things off to an energetic, business-meaning start. 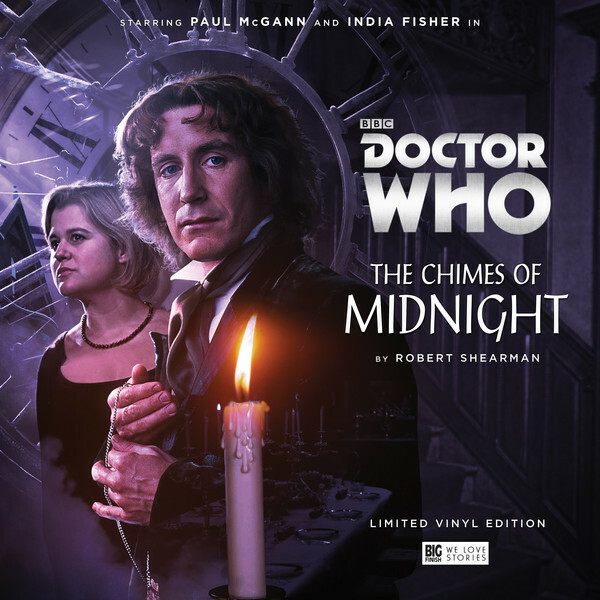 Robert ‘Dalek’ Shearman is a man with a good number of audio triumphs under his belt (Jubilee, the Frobisher stories etc), but whenever Big Finish fans gather together, The Chimes of Midnight gets an honourable head-bow. It’s a Christmas story that satirises the likes of Upstairs, Downstairs and (now) Downton Abbey, but really, it’s a story that takes creepy to the max and then kicks it forward into a dark cupboard full of spiders and skeletons and things with knives. This is one to listen to in daylight. As is this one – perhaps perversely given the title. A monster species that lives in a world of permanent darkness and thinks you should too, and much creepy, shiver-making whispering, not lease of the title phrase, makes this story from Nicholas Briggs utterly terrifying. It warms up and peters out towards the end, but the first half – stuff of nightmares. Ever wanted to take the Cybermen back to their body horror beginnings? The Silver Turk has the Eighth Doctor and Mary Shelley (Yes, that Mary Shelley) swanning about 19th century Austria pursued by the bizarre automaton that is The Silver Turk. But the Doctor knows it by another name altogether. This one brings the Tenth planet Cybemen to the party, and has all the gothic chills and pathos you could want. This isn’t really a beginning – as you might guess from the title, it’s an ending. If you want to hear the beginnings of the Eighth Doctor’s second companion, Lucie, get Blood of the Daleks – she explodes on audio from the very beginning, as you might expect of a companion played by Sheridan Smith. But if you get Big Finish fans together, there’s a silent sniffle and a catch in the voice that goes around every time they think of Lucie Miller/To The Death. A second Dalek Invasion of Earth is here. Susan, the Doctor’s granddaughter is here. Tamsin Drew, another Eighth Doctor companion, returns for this story – and so does a brilliant villain with a unique take on the Doctor’s dilettante Time Lord lifestyle. Yes, this one’s a brutal two-parter, but once you’ve heard it, you’ll never unhear it, and you too will get a choke in your voice when you think of it.